Nvidia needs lte tech. Maybe buy another chipmaker -- broadcom? Nvidia's Tegra 3 system-on-a-chip for smartphones and tablets is getting a bit long in the tooth, but the company still hasn't officially announced when its successor, an SoC codenamed "Wayne," will be available in shipping products. We expect an official announcement soon—perhaps even at Nvidia's press conference at CES—but for now we're still piecing together information from older announcements and alleged leaks. One such leak appeared this week, courtesy of Chinese-language site ChipHell. If it's legitimate (and it does appear to line up with information we already knew), it points to Wayne being a powerful SoC best suited for high-end tablets, but also a good fit for small, inexpensive ARM-based laptops or desktops. 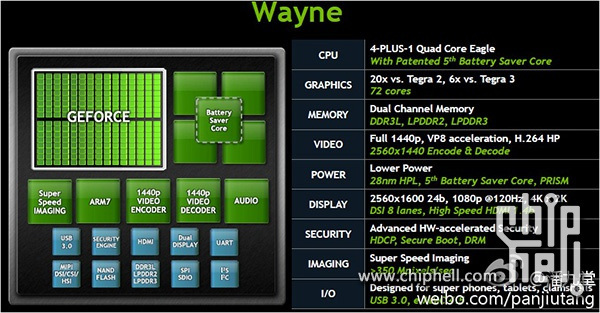 What we know so far paints a remarkably complete picture of what Wayne looks like, what it will be good at, and just how much better it will be than Tegra 3. This leaked slide gives us a clear look at Wayne. You know, if it isn't faked. As in any SoC, the biggest focus is going to be on the CPU and the GPU. Tegra 3 combined four Cortex-A9 CPU cores with an extra low-power "companion core" that will switch on when a device is asleep or idle to continue performing background tasks. Wayne changes those A9 cores in for higher-performing Cortex-A15 cores. While we don't know clock speeds yet, you need look no further than our Nexus 10 review to see how thoroughly even a dual-core Cortex-A15 beats a quad-core Cortex-A9.